Restore points are a handy way to undo problematic system changes. Even though you can control it some, restore points can only go back so far. System Restore is really intended as a kind of "short term" safety net. By that I mean that if you make a change that destabilizes your system, you should be able to quickly tell, and then use system restore to revert to the way things were before that change. The common scenario is that you realize that quickly; often within minutes of having made the change. System Restore wasn't really intended to be able to restore you back to any arbitrary time in history. It has limits. Limits you can control, somewhat, but even then there are limits. Each time a restore point is created, Windows saves a bunch of information related to the state of your system at that moment in time. That "bunch of information" takes up disk space. Since system restore is documented as "created daily and at the time of significant system events (such as when an application or driver is installed)", they can add up. "If the space required by System Restore exceeds the amount available it will start deleting the oldest restore points." That's where the limits come in. Here you can see, and control, the amount of disk space allocated to System Restore. In my case a maximum of 12% of my disk space is made available. 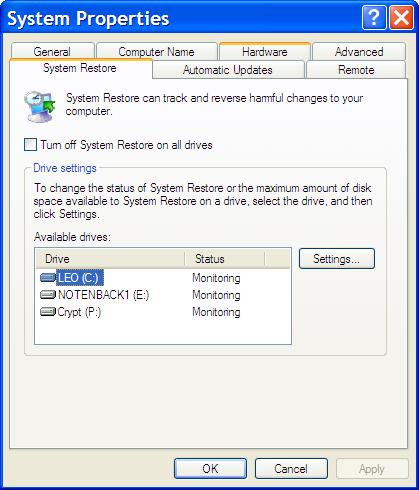 If the space required by System Restore exceeds the amount available it will start deleting the oldest restore points. If your restore points aren't going back as far in time as you expect, that's probably exactly what's happening. With a good backup or imaging program you should be able to restore your entire machine to any arbitrary date for which you kept the backup. Ask Leo! - How do I get at System Restore in Windows XP? Ask Leo! - Why didn't my backup program restore everything? anonSystem restore is badly named. System Restore is badly named. It does NOT restore the system to some time in the past. It will remove some drivers that were installed and that is about all it does. Leo..I am rookie pc SR user but you didn't mention Systems Restorers calandar can be back dated.He didn't mention going to previous months.BTW, how many months will this baby retain? Its saved this ole Seniors a** several time!! (Why are there no/Are there any) system restore point archival programs out? (If this a new and actually good and useful idea and someone makes it, I wanna share of the profits...). System restore does all sorts of things. I'm not sure if anyone except Microsoft fully understands what it does. Even more so on Vista. For a start, it backs up all files protected by Windows File Protection (and if they change then it backs them up again - with the changed version). It copies the entire registry which is a database of all Windows settings. Since drivers have both registry entries and are protected by Windows File Protection (which is the mechanism on which "System File Checker" [sfc] relies) System Restore does cover driver changes, but driver changes in themselves have their own "Roll Back Driver" feature elsewhere in Windows. Windows Vista (all versions - although its not accessbile on some versions, it does do it on all versions) goes further by applying System Restore to personal files like documents, pictures etc so that it takes copies of them as well. This feature is called previous versions. I've used system restore successfully in the past, but for some strange reason, it suddently stopped working. I've verified all the settings and everything looks fine. I'm not 100% certain, but this strange behavior could have started after I installed (and used) the CCleaner program (which I use almost everyday). Could this be wiping out the data from the restore point utility? Any help would be most appreciated. System Restore is a piece of junk. It takes up several GB of disk space and for what? It does not back up files, just settings and information. I rather use those 5-10GB of space to save fully backed up versions of windows. Also, be aware that many current backup programs also create restore points and are much more efficient than that of the windows version. They actually deal with full backups unlike system restore and there restore points will monitor your last backup file and extend that information to create the latest restore point. This means much less disk space and 100% pure software/hardware restoration! Because it can take a Really Long Time to backup completely over the internet. See this article: Can I do my backups over the internet? You never mentioned how to go to a restore point when you start in the SAFE mode (F8). You can go back to a restore point of your choice. The issues discussed in this article are the same whether you're using safe mode or not. 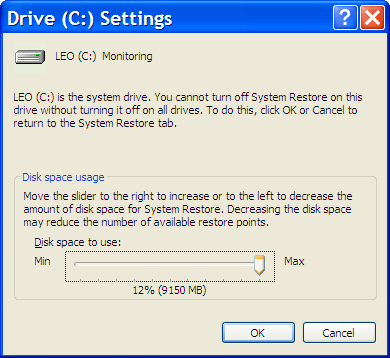 Leo...I've read the comments here on System Restore on this page and others, your archive, re:available space, etc...but I still have a question on how far back I can be expected to go...After attempting a comfortably previous date as a restore point I get the pop-up which says "error 0x80070003". My chart (Win 7 Home Premium)indicates RAM 2.00GB (1.87 usable). Free Space=221GB out of 289GB total. Am using an HP Slimline 32 bit system. Now, with what info.I've provided, why can't I go back at least two months for a real "back point". All I'm presented with is about 5-6 options going back no further than a week or so. Not what I want. Sorry for this verbosity, but I lack the techie vocabulary to be more terse.